The origins of tipping can be traced at least as far back as the Roman Empire. Wealthy Americans brought tipping to the states from Europe in the 1850s so that they could show off their knowledge of European customs. And the rest is history. While tipping has been phased out in Europe in favor of a hospitality-included model, tipping is now as American as apple pie. However, over the past few years, some restaurateurs have begun chipping away at the well-ingrained cultural norm by banning tipping at their restaurants and instead absorbing service charges into menu prices (once again taking a cue from Europeans). 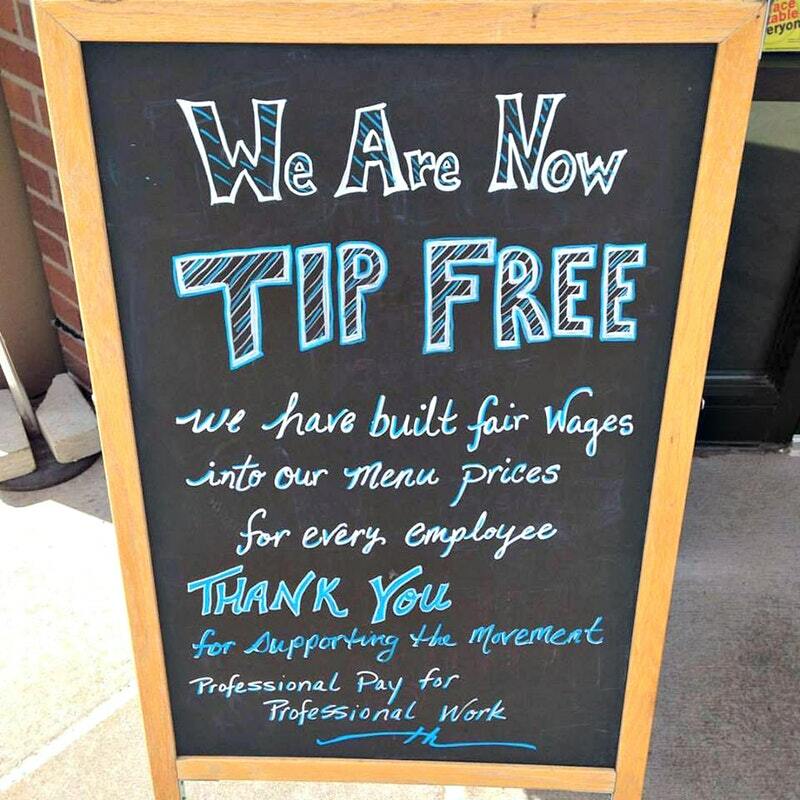 When he finally abolished tipping in 2015, Meyer cited closing the gap between tipped, front-of-house workers’ and non-tipped back-of-house workers’ earnings as one of his main motivators. Under his tip-free model, every individual employee benefits from revenue-sharing. 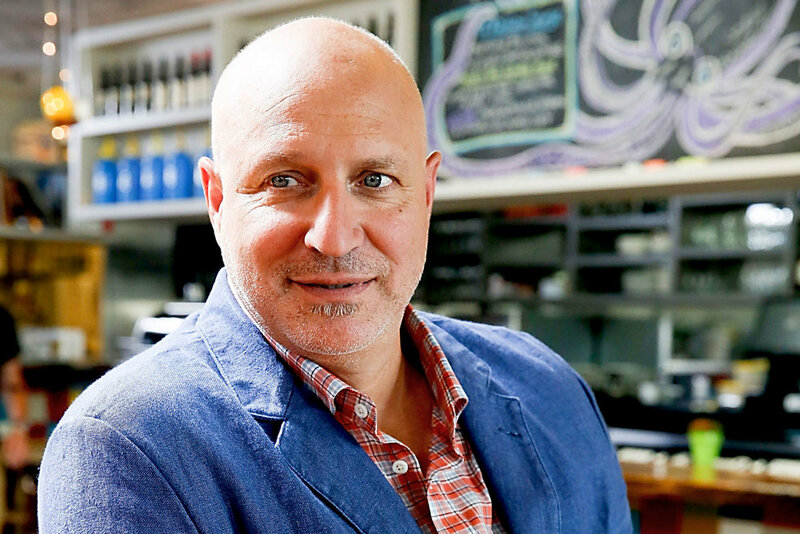 Colicchio was also a vocal supporter of restaurants moving toward the tip free-model when he eliminated tipping at his flagship restaurant Craft in 2015. He told CNBC’s “On Money” that he chose to go tip-free so that he could compensate his staff members more fairly. Meyer and Colicchio removed the line on the check where customers would typically add in a tip. To compensate for lost tips, the chefs raised menu prices around 20% so that they could increase their staffs’ wages. Hundreds of restaurants across North America have followed suit. However, some restaurants who have tried the model have abandoned it, citing lost business. Colicchio’s Craft is one of them. Colicchio reversed his tip-free policy in 2016. Although he still believed in the reasons that restaurants are going tip-free, he conceded that the model cannot be successful until all restaurants adopt it. So, should your restaurant ban tipping? We’ve rounded up some of the most common arguments for and against going tip-free. One of the most compelling arguments in favor of going tip-free is that it leads to higher wages for back-of-the-house workers like cooks and bussers. At restaurants where the average check size is steep, back-of-the-house workers typically make less than tipped servers even though their base wages tend to be higher. This data from Bon Appetit is pretty staggering. 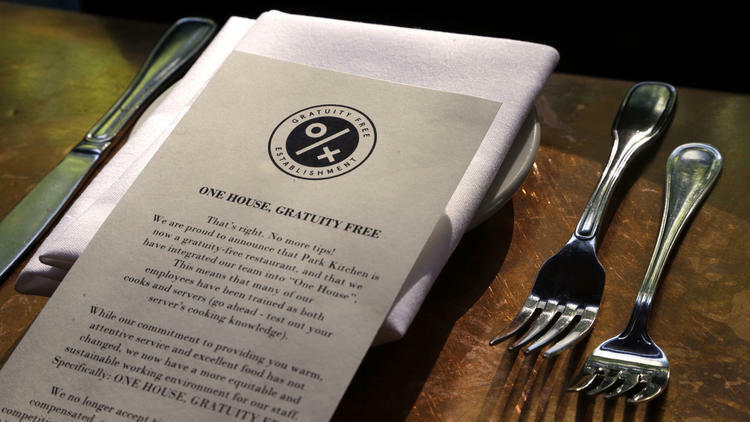 Under the tip-free model, BOH workers are included in the restaurant’s revenue-sharing policy. That’s why Meyer reported raising menu prices just over 20% (20% is widely acknowledged as the standard restaurant tip). After going tip-free, Meyer raised the starting hourly pay for line cooks at the Modern from $11 to $14. A positive side effect of higher BOH wages—in addition to more appropriately compensating staff members hard work—is a stronger BOH staff (which translates into higher quality food!). According to Seattle restaurateur Renee Erickson, who went tip-free at Sea Creatures, eliminating tipping is a good investment for restaurants because it results in less BOH turnover. Less turnover means less rehiring and retraining on your end as well as more experienced cooks. Another reason many restaurants are going tip-free is to increase their servers’ wage stability. As you probably know, in many states, the minimum wage for tipped workers for tipped workers is lower than the minimum wage for non-tipped workers. 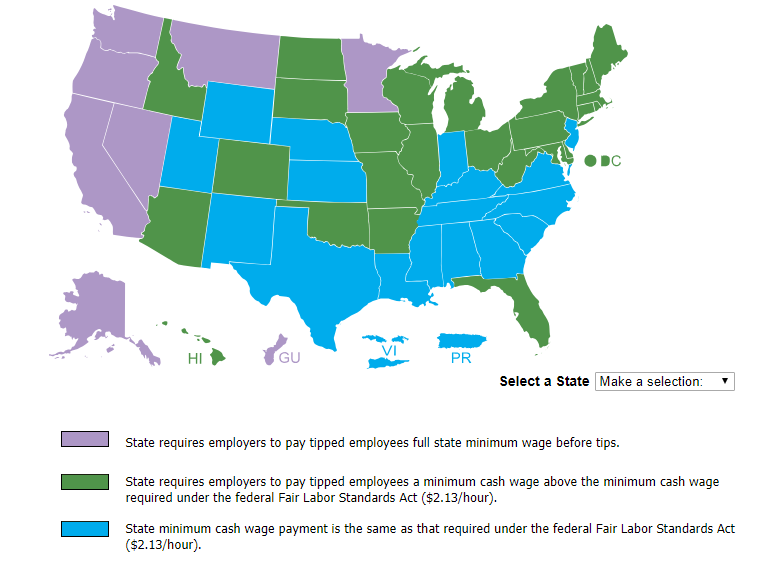 In fact, only seven states require employers to pay tipped workers the full minimum wage. In the other 43 states, the minimum wage for tipped workers can dip as low as $2.13 an hour. Workers are expected to make up the difference with tips (employers are legally obligated to make up the difference if servers earn less than minimum wage after tips, but investigations by the Wage and Hour Division of the Department of Labor between 2010 and 2012 found an 84% non-compliance rate). Although tipped workers have the potential to make great money through tips, that is entirely dependent on check size and what percent of the total bill customers decide to tip. So, while tipped workers can make a lot in a day, they can also make very little. 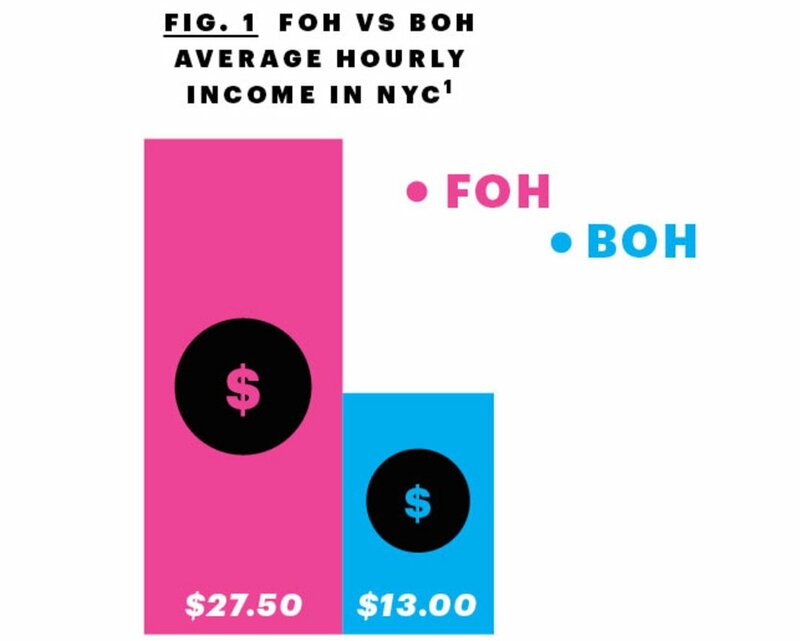 At restaurants with lower menu prices or where diners tend to tip less, FOH workers can actually make much less than BOH workers. In fact, a 2011 EPI study found that tipped workers are more than twice as likely as non-tipped workers to fall below the poverty line. Moreover, research has shown that perceived service quality explains less than 2% of the variation in tip percentage. Clearly, your servers are being tipped based on factors that are out of their control. For example, young diners typically leave smaller tips. About ⅓ of millennials tip less than 15% (whereas only 16% of older demographics admit to doing so). In a recent survey, 10% of millennials said they don’t tip at all! Replacing the tipping model with a revenue-sharing one leads to less income variation from day to day and moderates the effect of working a slow shift or serving particularly stingy diners. Regardless of your intentions, servers may not be happy about you banning tipping at your restaurant. Many servers, especially those who are used to collecting generous tips, are opposed to the tip free model. After Bar Agricole went tip-free, servers made an average of $20-35 an hour instead of $35-45 an hour. The pay cut led 70% of servers to leave the restaurant. Likewise, Meyer says he lost 30-40% of his FOH staff after eliminating tipping at his restaurants (one Union Square Cafe server claims that her annual pay dropped $10,000). So, while going tip free has been shown to reduce BOH turnover, it can increase FOH turnover. Apparently, customers aren’t too happy about restaurants going tip-free either. A 2016 survey found that 81% of Americans were opposed to the idea of eliminating tipping. Why? There are a few plausible reasons. First, people believe that the service is worse at tip-free restaurants because there is no incentive for servers to perform well. Second, research shows that people are happier when they can leave a large tip. Third, people have the urge to penalize poor service. So, when customers lose the ability to adjust tip size, they feel alienated. According to Dr. Lynn, tip-free models can lead to negative reviews. When Dr. Lynn looked at Google reviews and yelp ratings for 18 Joe’s Crab Shack restaurants where the company temporarily suspended tipping. Ratings on a five-point scale decreased by a third of a point on average during that time. Some customers have gone beyond leaving negative reviews. In October, consumers in New York and the Bay Area filed a class action lawsuit against, Meyer, Colicchio, and other notable restaurateurs who have gone tip-free. They alleged that the owners were holding secret meetings and eliminating tipping for the sole purpose of raising prices as part of an anti-competition conspiracy. According to Dr. Lynn, customers experience “bundled” prices differently than they do “partitioned” prices. So, even though customers will eventually have to add gratuity at restaurants that accept tips, they see menu items as cheaper than at restaurants where hospitality is already included in the menu price. When NYC restaurant Fedora went tip-free, customers ordered less food or lower-priced wines. This led to a loss in revenue, so the restaurant reinstated tipping after four months. Colicchio reported a similar experience. To be fair, customers do end up paying a bit more at tip-free establishments because restaurants often raise menu prices more than 20% so that they can share revenue with FOH and BOH employees. This means that customers could pay up to 5% more if they usually tip 20%, or more if they usually tip less than 20%. It’s pretty clear that whether or not you should tip free depends on a number of factors. For example, when determining what’s best for you and your employees, think about the average check size at your restaurant and how your customers would react to higher menu prices. So, where do you stand in the tipping debate?